Loaded Mashed Potato Casserole is an upgraded version of your favorite mashed potato casserole recipe. 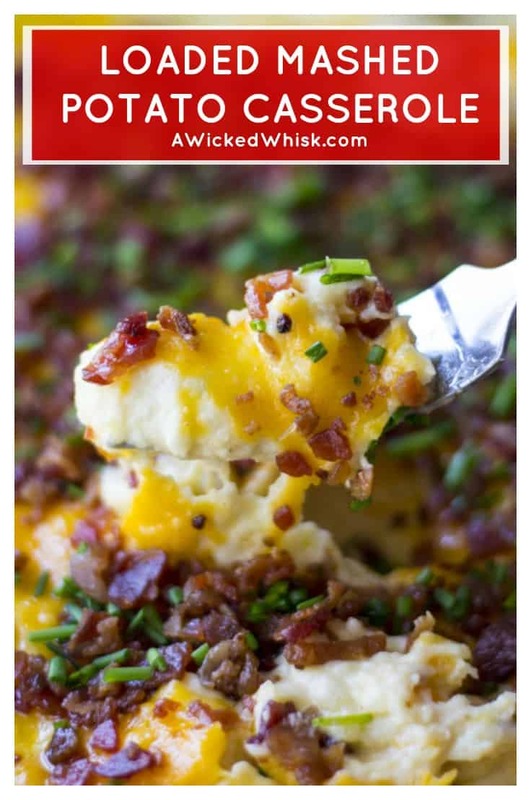 Smothered in melted cheese and BACON, this Loaded Mashed Potato Casserole is the best side dish ever! Are you a person who could eat baked mashed potatoes literally every day of their life? That is 100% an accurate description of me. Mashed potatoes, boiled potatoes, sauteed potatoes, mashed potato casserole, hash browns, loaded baked potatoes, loaded potato skins, etc, etc, etc,. I don’t care what you do to them, I don’t care what you put in them, how you serve them or how you make them, potatoes have got to be in my top TWO favorite food groups. And if potatoes are not an official food group, they should be! WHAT IS IN LOADED MASHED POTATOES? 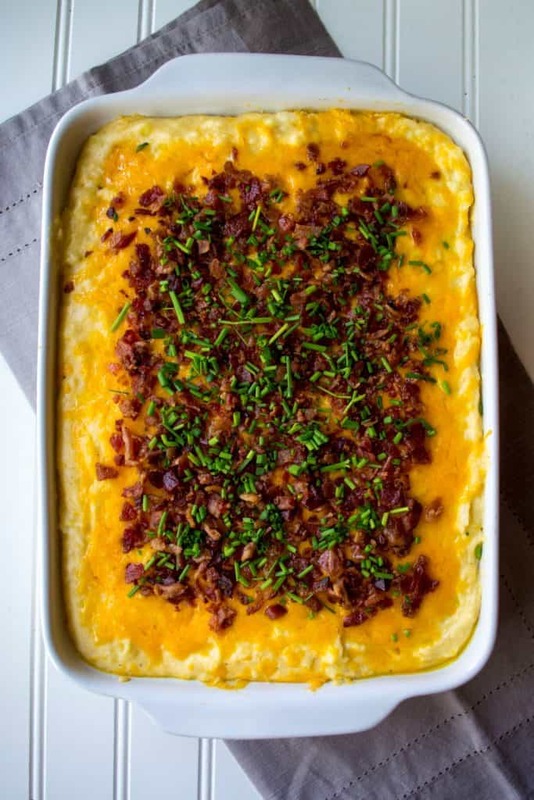 Although you can customize your Loaded Mashed Potato Casserole anyway you like, traditionally loaded mashed potatoes are mashed potatoes with cheese, bacon, chives or green onions and often, sour cream. 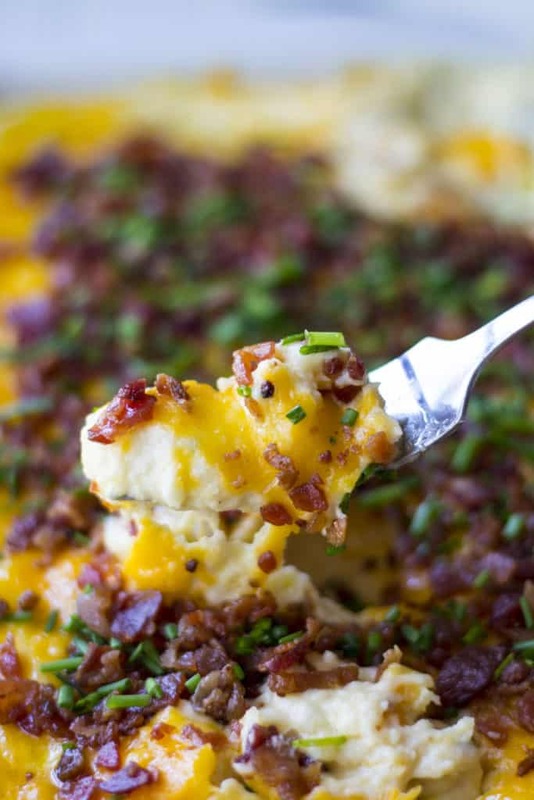 Think of this Loaded Mashed Potato Casserole recipe as a cross between mashed potatoes and a plate of loaded potato skins from T.G.I. Fridays. ARE BAKING POTATOES GOOD FOR MAKING LOADED MASHED POTATOES? In my opinion, russet potatoes are the best! Russets whip up fluffy and light after they are cooked. They are the perfect potato for making mashed potatoes and therefore are perfect for your Loaded Mashed Potato Casserole. 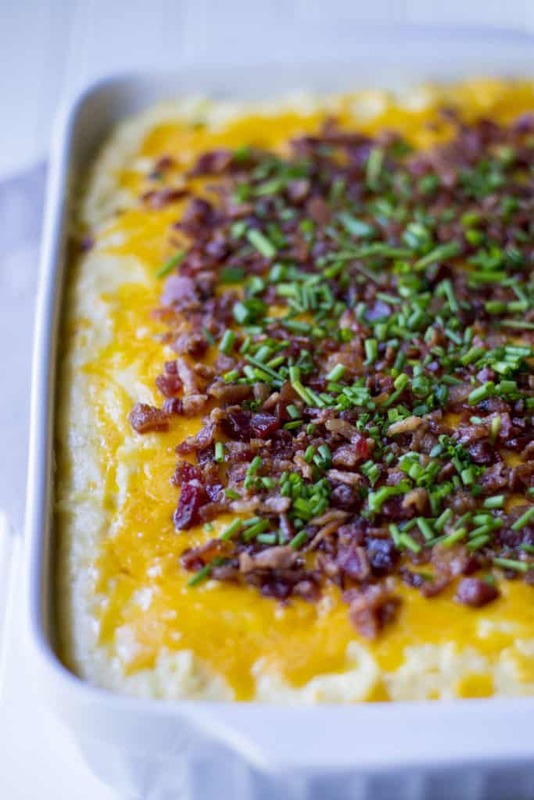 HOW DO I MAKE LOADED MASHED POTATO CASSEROLE? To make your Loaded Mashed Potato Casserole, preheat oven 350 degrees and lightly spray 9×13 pan with non-stick spray and set aside. Wash potatoes, peel and cut into medium sized same size chunks. Add to large pot of salted water and bring to a boil. While potatoes are boiling, melt butter in a small saucepan over medium high heat. Add diced onion and cook for 4-5 minutes. Add garlic powder and stir to combine. Remove from heat and set aside. Let potatoes low boil for approximately 10 -15 minutes or until they are fork tender. Drain and return to pot. Add in cream cheese, Parmesan cheese, butter/onion mixture, salt, pepper, cream, sour cream and 1 1/2 cup of cheddar cheese to potatoes. Mash potatoes or whip them with an electric beater (depending on your preference) and then transfer potatoes to the 9×13 pan. Cover potatoes with remaining cheddar cheese and bacon. Bake for 15 minutes or until cheese is melted. Remove from oven and garnish with chives. Serve immediately. Cover and refrigerate any leftovers. This Loaded Mashed Potato Casserole is super easy to make and you are rewarded with the most amazing baked mashed potato casserole side dish to treat your family and friends with. That’s if you decide to share, which is encouraged but not actually required. 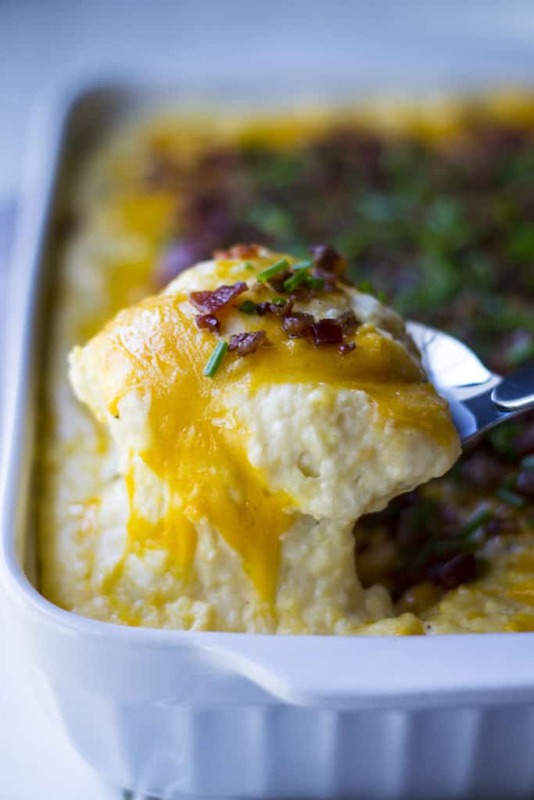 So next time you are looking for a side dish to beat all other dishes, give this recipe for Loaded Mashed Potato Casserole a try. This will be the highlight of your entire year!!!!!!!!!!!! Looking for more side dish and potato ideas? Don’t miss out on my Loaded Potato Skins, my Loaded Potato Salad, my Spicy Honey Glazed Carrots and my Creamy Macaroni and Cheese! Yes, please! Preheat oven 350 degrees and lightly spray 9x13 pan with non-stick spray and set aside. Wash potatoes, peel and cut into medium sized same size chunks. Add to large pot of salted water and bring to a boil. While potatoes are boiling, melt butter in a small saucepan over medium high heat. Add diced onion and cook for 4-5 minutes. Add garlic powder and stir to combine. Remove from heat and set aside. Let potatoes low boil for approximately 10 -15 minutes or until they are fork tender. Drain and return to pot. Add in cream cheese, Parmesan cheese, butter/onion mixture, salt, pepper, cream, sour cream and 1 1/2 cup of cheddar cheese to potatoes. Mash potatoes or whip them with an electric beater (depending on your preference) and then transfer potatoes to the 9x13 pan. Cover potatoes with remaining cheddar cheese and bacon. Bake for 15 minutes or until cheese is melted.